She was my parishioner; we spent with her long hours when I was visiting sick people. She, with her walking stick and in her famous black loose overall was persistently following and always kept up with me. She was a personality of an exceptional profundity and subtle intellect notwithstanding some eccentricity and the desire to look and behave like yurodivy. Yudina's "outer" and "inner" biographies differed from each other as day and night. She studied at the Petrograd Conservatoire under the tutorship of Leonid Nikolaev. And at the same time she studied at the Petrograd University, Department of history and philosophy. Then she worked at the Leningrad (1921 - 1930), Tbilisi (1932 - 1934), and Moscow (1936 - 1951) Conservatoires, at the Gnessins' Institute of Music (1944 - 1960). She died in 1970. This is a "dotted line" of her life. But then there was another life. She maintained good friendship with Mikhail Bakhtin, Pavel Florensky, Marina Tsvetaeva, Dmitry Shostakovich, Sergei Prokofiev, Boris Pasternak, and Nikolai Zabolotsky. She was member of some philosophical societies and in particular took part in the meetings of the Alexei Losev's group. She maintained correspondence with the classics of the postwar musical avant-garde, Shtockhausen and Bulez. And she played the prewar classics, Schonberg, Webern, Berg. She wrote a letter to a thankful listener, Joseph Stalin, who happened to catch a Mozart concerto on the Soviet radio played by Yudina. He was so impressed that asked for a gramophone record to be sent to him. Yudina and the entire orchestra were brought to the studio at four in the morning to make a recording by the next afternoon. Yudina received a "material assistance" from Stalin and in return sent him these notes: "I will pray for you day and night to ask God to forgive your terrible sins before people and the country. God is merciful and will forgive you. And I will pass the money to the church of which I am a parishioner". She was fired from all institutions where she worked (for propaganda of religion and "worshiping of the formalism"). She read poetry of the disgraced Pasternak strait from the stage at her recitals. And she wrote and read tremendous essays about Bach and Mussorgsky examining the music through the prism of the Gospel. Finally, about her concerts, recitals and recordings. She played an immense repertoire, from Bach to the music of the 20th century. But with all the fantastic diversity of the composers the Gods of music of the modern time for her were Stravinsky, Prokofiev, and Shostakovich. Yudina's achievements in chamber music deserve a special mention. She discovered unexplored depths and invisible horizons in interpreting Brahms and Taneev's Piano quintets. And the quality of her piano art is so high that, paraphrasing Schumann, the best way to talk about it is to keep silence. 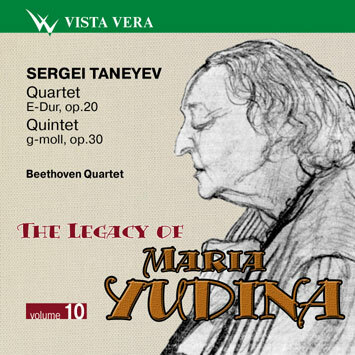 In a modern world of art which is poisoned by "competition mania" and the music is transformed into sort of professional sport where the number of notes for the unit of time becomes a criteria of quality Maria Yudina remains a high standard of moral and professional purity and perfection. "The Great Art belongs to Eternity. It inevitably and invariably gives projection to the Future". - An outstanding Russian pianist Maria Yudina once said this. And it could be said about her distinctive and significant performing art. Her presentation of a great number of compositions, from Bach and Beethoven to Shostakovich and Stravinsky, despite and may be because of the original and daring interpretation, even today projects some astonishing magnetic power thus expanding the frontiers of our perception to an unprecedented scale. Yudina was capable of hearing a work of a composer in a broad historical, philosophical and religious context, in a context of Eternity. A famous German composer Karlheinz Stockhausen once said that artists like Yudina picked up "the sound of time at a distance, then rendered a great impact on the present and influenced the future". This is what makes Yudina's performing art a part of spiritual culture.